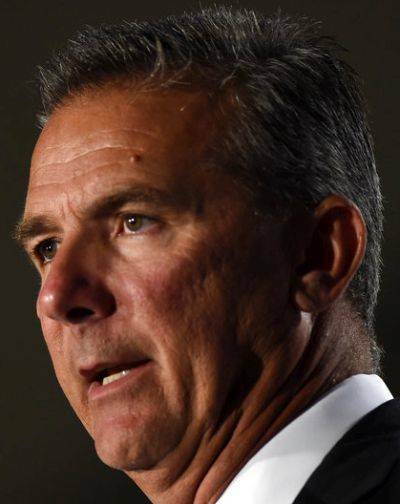 COLUMBUS — Ohio State placed football coach Urban Meyer on paid administrative leave Wednesday while it investigates claims that his wife knew about allegations of domestic violence against an assistant coach years before he was fired last week. Courtney Smith gave an interview to Stadium and provided text messages to former ESPN reporter Brett McMurphy between her and Shelley Meyer in 2015 and with the wives of other Buckeyes coaches. Courtney Smith also provided threatening texts she said came from her ex-husband, former Ohio State assistant Zach Smith. Zach Smith was fired last week after an Ohio court granted a domestic violence protective order to Courtney Smith. The couple is divorced. A few hours after Courtney Smith’s interview was posted online, Ohio State said it was conducting an investigation into the allegations and Meyer was being placed on leave. Offensive coordinator Ryan Day will serve as acting head coach for the Buckeyes, expected to be one of the top teams in the nation again this season. Ohio State’s first preseason practice is scheduled for Friday. The season opener is Sept. 1 against Oregon State in Columbus. Meyer said in a prepared statement he and athletic director Gene Smith agreed that his being on leave was best. “This allows the team to conduct training camp with minimal distraction. I eagerly look forward to the resolution of this matter.” Meyer said. Meyer is heading into his seventh season at Ohio State, where he is 73-8 with a national title in 2014 and two Big Ten Conference championships. Shelley Meyer is a registered nurse and is employed as an instructor at Ohio State. Both Meyer and his wife could be in violation of Title IX policy on reporting allegations of domestic violence against university employees.